There's something about spring and the cheerful colors that go with it. The thoughts of soft pinks, blues and violets send me to my rock collection for hues to cab. What I found was two different pink minerals I'd acquired this January when I was in Quartzite, They gave me a head-start for this year. First, I saw this beautiful, smooth pink rock. It had some slight variations in color, but I loved the pink-ness of it. The seller called it thulite, although I've heard some people call is rosaline. On the mohs scale, it clocks in at 6.5 and it was easy to work. Because of the softness, it finished to more of a luster than a shine, but it made it shiny enough to make it difficult to photograph. I thought I had it out of focus until I looked at the cab directly again, yes, that's how it looks! There is a bit of a black dot at the bottom from the original slab. I'm thinking that the spot can be hidden when the cab is mounted. At 20mm diameter, it will be an eye-catching element in a necklace or bracelet. Of course, that's easy for me to say, since I tend to craft cabochons just for the pleasure of it. I have a lot of them . . . It's easy to see the fuzzy black lines, however, the large expanses of pink turn the black into an accent, not the main event. When I was playing around with the whole slab and my stencils, I heard a quiet whisper that it felt feminine, and liked the idea of it having a grey fur coat draped over its shoulder. This mineral is a 5.5-6.5 on the Mohs scale which makes it very similar to the thulite in terms of how it is to work. So that's what I did. What do you think? In researching these minerals, I found an interesting connection--why they're both pink! Both minerals contain manganese. It is normally considered a gray mineral, but when it is oxidized, it can impart a pink color. Like what you see here? Please go to the top of the right side column and subscribe. You'll get my blog automatically delivered to you every two weeks and your contact information will never be shared or sold. Check back on April 12 for more musings by your Lapidary Whisperer where stromatolite will be trying to discover whether its story is about a Starry Night or a Nightmare on Elm Street! Do you want to cook it or cut it? I admit that when I first saw this slab in Quartzsite, my first impression was that a strip of nice, fatty Wygyu beef had gotten lost. (If you haven't already noticed, I often "see" food in rocks which has led to some very interesting projects). When I picked it up, it was obviously solid, but it didn't feel like a jasper, it felt smooth and if you will, creamy.It turned out to be Alunite--a mineral I'd never heard of. 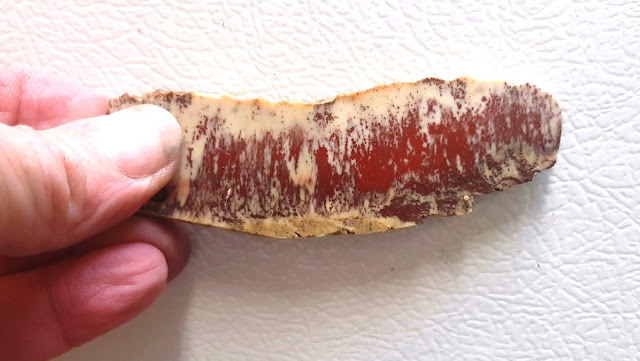 It is mined and processed to become potash alum which is then used as an astringent medically and and some food preservation including pickles--and, of course, it's used in lapidary! As I pushed aside the thoughts of yummy beef, I noticed that the red markings could also be taken as an image of fire. In January, I'm always looking for something to carve into a heart shape. My Contra Costa Mineral & Gem Society has contests where the members vote on cabochons. The Shape of the Month for February is always a heart. It occurred to me that there might be a Heart on Fire hiding in the slab. So after I got home from Quartzsite, I got to work. I found the softness to be a benefit while I was working the bumps at the top of the heart. Also, because of its soft nature, it took more of a luster than a shine. It will reflect bright light a bit, but even polishing it with a 50,000 grit wheel, it never became truly shiny. When I finished, it looked to me like it could be a Heart on Fire, but it could also be a Bleeding Heart. Figuring no one would vote for a Bleeding Heart at Valentine's Day, I submitted it as Heart on Fire. Even though it was a relatively small slab, I was also able to get the pillow-top and egg-shaped cabochons out of this stone. I'd like to use the pillow-shaped one for a ring, because it is fascinating to look at the random pattern. It's easily my favorite of the three cabs I was able to make from this slab. I don't even remember where I found this colorful slab, but I love it. It has so many stories hidden in it. I played with an edge on my Genie and found it somewhere between jasper and agate in terms of working it as a stone. My first thought was some sort of petrified wood, but yet . . .
Do you have any sense of what it is? I'd love to know what you think. Best guesses will be published in a future LapidaryWhisperer. Check back on March 29 for more musings by your Lapidary Whisperer. Since it's spring, think pink!